Works from the Indian subcontinent include pieces from what is now India and Pakistan associated with the Muslim, Hindu, Buddhist and other religions. 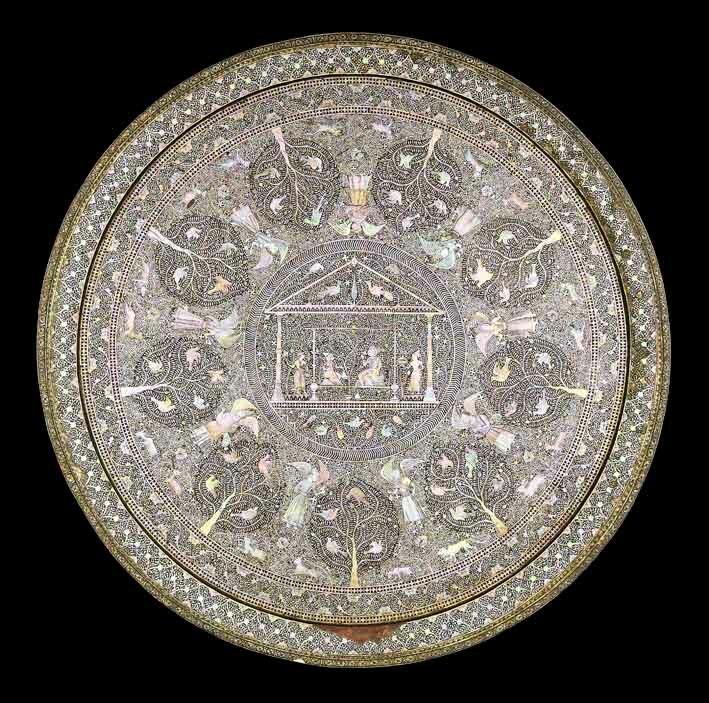 Collectable categories include items made during the colonial period when pieces were also made to appeal to Western taste; Indian watercolours (miniatures); jewellery decorated with enamels and set with rubies, emeralds and other gems; and hardstones, especially jade, carved into intricate handles for edged weapons or receptacles. A south Indian Bidri pear-shaped tray dating from the 17th century has been temporarily blocked from export from the UK by the Department for Digital, Culture, Media and Sport (DCMS). The UK government has issued an export bar for Nainsukh of Guler’s ‘Trumpeters’, valued at £550,000. Two early examples of Indo- Portuguese furniture sold for five-figure sums at auction this month. A 12th-century Chola bronze, stolen from a museum in India nearly 60 years ago, has been returned to the country after it was discovered at a London antiques fair earlier this year. Cirencester saleroom Moore Allen & Innocent (20% buyer’s premium) enjoyed a taste of India’s fast-growing art market when three pictures by the Indian folk artist Jamini Roy (1887-1972) were scooped up for a total of £24,500. Among several runaway lots at Duke’s (25% buyer’s premium) Asian Art sale in Dorchester was a 19th century Indian watercolour depicting the Mughal Emperor Akbar II on an elephant. An 18in (45cm) figure of Shiva Vinadhara c.12th century – £220,000. Sotheby’s is to return to holding auctions in India to take advantage of the growing wealth in the Asian nation. It plans a sale in December at The Taj Mahal Palace hotel in Mumbai. Sotheby’s is to return to holding auctions in India to take advantage of the growing wealth in the Asian nation. This 17th century Indian painting attributed to one of the best artists of the Mughal court sold for £42,000 at Sworders’ December 5 Country House Sale. This 17th century Indian painting attributed to one of the finest artists of the Mughal court was recently discovered in a private collection in Suffolk. Sworders will offer it for sale in their December 5 Country House Sale with an estimate of £10,000-15,000. A selection of Indian Company School paintings is among the lots on offer at Bristol Auction Rooms next month. The mysterious history of the Koh-i Noor diamond will be revealed during the Hay Festival by authors of a new book. Kensington Church Street dealer Butchoff Antiques hosted an exhibition of Indian artworks to celebrate the UK India Year of Culture, which was launched by The British Council and the Indian High Commission earlier this year. An exhibition of Company School painting takes place at Francesca Galloway’s space in Dover Street from May 22-July 7. A late 18th century Rajput miniature with an excellent provenance is to be offered at auction next week at Mallams in Cheltenham.